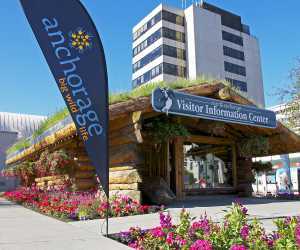 The best time to visit Anchorage depends on what you plan to see and do. Each season holds something special. Forget robins. In Alaska, grey whales are the first wild sign of spring. They are the first of many species of whale to arrive in rich Alaska waters to feed. Whale watching day cruises depart as early as April 1. Massive flocks of birds also migrate north to summer nesting grounds like Potter Marsh. You can also get a jump on many popular summer activities like hiking and flightseeing. Summer is in full swing as new born moose calves arrive in early May. Beluga whales follow fish close to shore, delighting travelers along Turnagain Arm. Salmon return to spawn, meaning good viewing and fantastic fishing. The greatest number of glacier cruises are on the water. Dogsledding heats up, literally; sunny dogsled rides are offered on wheeled carts or atop nearby glaciers in Girdwood and the Matanuska Valley. Summer trains of the Alaska Railroad head into the heart of Alaska. Kayaking, hiking, biking and summer day tours get out and make the most of long summer days. The sun sets, but it’s never dark enough for streetlights. Autumn crackles as the northern lights return. You’ll find great fall deals on accommodations and airfares. The seasons are changing, but signs of summer linger; many day cruise companies operate until October or even year-round out of Whittier. Hiking and biking are still great. Birch and aspen trees turn a brilliant yellow, and moose cluster close to the city as forage becomes scarce. It’s also rut, so bull moose sport picturesque racks of antlers as they joust for mates. Mild temperatures and plenty of snow make Anchorage a winter playground. It&apos;s prime time for aurora tours. The mountains surrounding Girdwood get more than 42 feet of average annual snowfall. Alaska’s largest ski resort is also a base for heli-skiing. Winter biking and Nordic skiing take over the trails around Anchorage, all groomed and maintained by the ski association or the city. Classic Alaska events including the Iditarod, Anchorage Fur Rendezvous and the Tour of Anchorage fill the calendar.